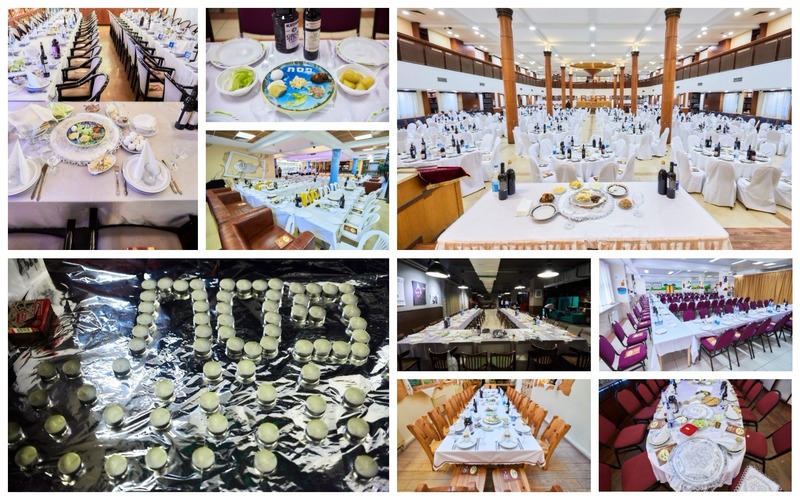 Just before the Passover night began in Moscow, photographer Levi Nazarov went out for a quick round of shots to capture the preparations for about 3,000 guests in the central Marina Roscha Jewish Community Center. In order for every guest to receive personal attention and to ensure the evening’s orderly procedures, the seders were divided by groups and languages, with the main seder led by the Chief Rabbi of Russia, Rabbi Berel Lazar in the synagogue’s main hall. The rest of the seders were led by an army of rabbis. Each rabbi led a seder of a specific group, which were all color-coded based on tickets purchased in advance. The seders began on time as each guest knew exactly where to find their seat among the many seders that took place in all of the halls and foyers in the building, as well as the nearby buildings of Beit Shvidler Educational Campus and the Shaarey Tzedek Chesed Center, all organized by the Executive Director of the Marina Roscha center, Rabbi Mordechai Weisberg. A team of hundreds of waiters brought out the food from the main kitchens, which were koshered in advance by a large group of mashgichim under the supervision of the Chief Rabbinate of Russia. The food was prepared during the weeks leading up to the seder with utmost care. In addition, another 36 public seders were held in the various Jewish centers of Moscow, as well as in the yeshivot, educational institutions, and even in the city’s Butirsky prison.